Today, 6 October, marks the 43rd anniversary of one of Egypt’s greatest military feats in modern history. That day in 1973 the Egyptian army crossed the Suez Canal into Israeli-occupied Sinai and raised the Egyptian flag on Egyptian land that Israel had been occupying for six years following its victory in the Six-Day War. Israel had built what it described as invincible fortifications that would make it next to impossible for Egyptians to ever regain Sinai through battle, and had taunted Egyptians at their apparent inability to be on par with the Israelis. The period from June 1967 to October 1973 was dominated by a sense of bitter collective humiliation and despair for Egyptians. On 6 October 1973, as the Israelis marked Yom Kippur, the Egyptian army at 2:00pm crossed the Suez Canal in military dinghies, extended bridge heads to the eastern bank occupied by Israel, used water cannons to bring down the Bar Lev Line fortification, climbed the Sinai bank and raised the Egyptian flag as the Air Force defended the skies by hitting Israeli targets and engaging in battle with the Israelis. It was a remarkable feat that has gone down in military history, and paved the way for Egyptian Israeli talks that led to a peace agreement in 1979 and brought Sinai back to Egypt in 1982. More important, however, is that it redeemed Egyptians and gave them back their dignity and self-confidence. As Egypt celebrated the occasion with aplomb this year, the Egyptian Museum in Tahrir, Cairo, marked the occasion in a special way. 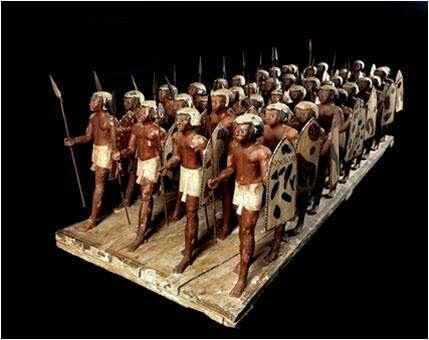 Its Facebook page carried as ‘Piece of the Month’ the image of a wooden artefact that depicts the Egyptian army in ancient times. The piece comes from the tomb of the 11th Dynasty (2125 – 1985BC) Prince Mesehti in Assiut, some 350km south of Cairo. The ancient wooden artefact was selected from among nine others which the museum put to the vote for its visitors to decide which would be the October piece of the month; all nine artefacts related to Egyptian military prowess in ancient history. Last June, the museum decided to offer the selection of its Piece of the Month, which had until then been selected by the museum board, in a public poll on its Facebook page. Egyptians would vote on which of a dozen artefacts posted on the page would be highlighted as Piece of the Month in the place of honour on the page. The Antiquities Ministry had launched the trend with the aim of giving Egyptians the opportunity to actively contribute to decisions that directly concerned their heritage.